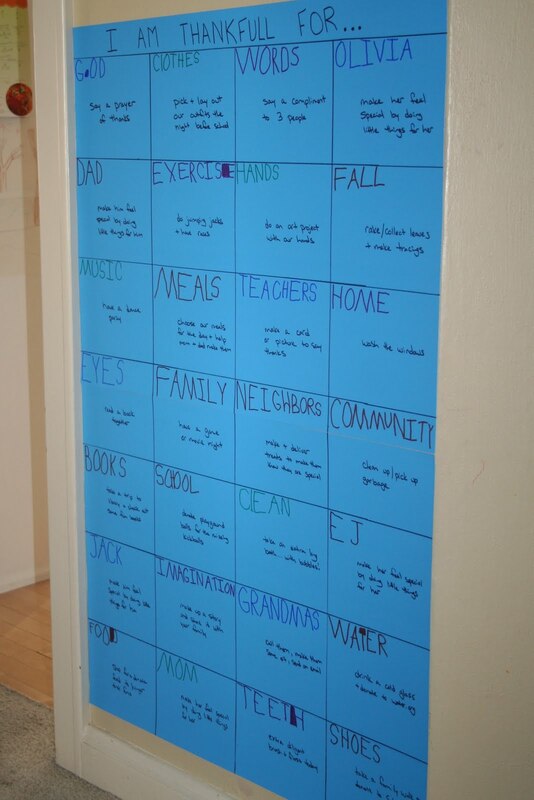 This year for our November thanks project we decided to take our card idea from last year and make a chart instead. We're hoping that with it being more visible to everyone (and at kid level) it will have more of an impact and we'll stay on task. We also chose to make the "actions" a little more doable/easy given that usually they are done on a weeknight (and often with just one parent home too). The kids had a lot of say in the things we would do and it was fun to work together to create the chart (words and design). Clean - take an extra long bath...with bubbles! The kids chose Exercise for our first evening activity. It was awesome for me as Jack and EJ created an huge obstacle course of sorts. They jumped toy hurdles, went to the living room to do arm circles, carried 10 books across the playroom...best of all, they set it up and executed it themselves (and worked really well together on it). I was thankful for sure! When they were done with their "action," we placed a sticker for each kid in the square so we know that one is completed. Those stickers are the best part of the chart in EJ and Olivia's eyes! The best part of the chart for me? That Jack thought up the list of things they are thankful for and that they are excited to do our activities and to talk about our many blessings! So clever! Love how all the kids get involved and think it's pretty cool that Jack is such a team leader :-) What an awesome big brother he is!